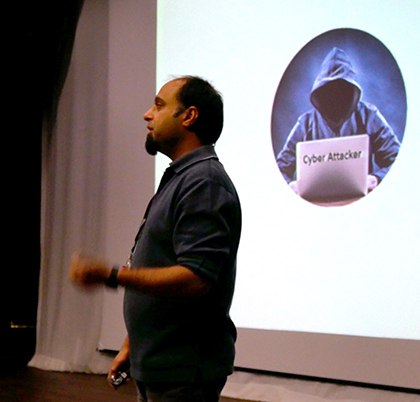 IT students at The Sixth Form College, Solihull explored the world of forensics and cybercrime this week, thanks to a lecture from Birmingham City University. Staff from BCU visited the College to talk to our A level and BTEC IT and Computer Science students and their presentation focussed on the types of crime that make use of computers and other digital devices such as smartphones, tablets and digital cameras. The presentation explored how sophisticated these crimes are becoming and how the police and intelligence age ncies can combat it. Students heard how forensics experts are increasingly being used to analyse ‘digital evidence’ to tackle these crimes. This trend has led to a rise in forensics related TV dramas and documentaries including CSI Cyber, Mr Robot and Cybercrimes with Ben Hammersley.